For as long as I can remember I have had a problem with books. As a general matter, I love them, and, as a consequence, cannot bear to part with one once I have it. This state of affairs has been true pretty much since college, and to prove it I still have every book I ever bought back in those heady days, including many engineering books now so hopelessly outdated they may as well be about how to manufacture rope from indigenous grasses. Doesn’t matter though; I still have them on my shelves and that’s the important thing. But my inability to discard books is not, strictly speaking, the topic of this essay. I mention it only to provide context for the somewhat dense and recondite material to follow. The task I have set myself with this bit of exposition is to explain the many and various nuances of rare-book collecting, at least as I’ve come to understand them from my several years at this avocation. Book collecting is the sort of pursuit that can lead to madness, and it is very important for the neophyte to fully understand the magnitude of what he is getting into before stepping toward the precipice. This is, of course, true in dealing with any collectibles, but the nuances associated with book collecting are truly beyond arcane, and making mistakes of judgment can turn out to be frustrating and more than a little expensive. I should add, by way of further clarification, that I will talk here specifically about collecting what are known in the book trade as First Editions, and even more specifically, First Editions in modern American fiction. It’s worth limiting the focus in this manner right from the get-go, because as nuanced as this sort of collecting turns out to be, there are plenty of additional details that attend collecting, say, antique Bibles or original copies of Audubon bird painting books, that can only serve to exacerbate an already fraught topic. So there we are: American fiction First Editions. But where to begin. The term First Edition itself is as good place as any. The phrase is so rife with ambiguity and misunderstanding that many well-meaning collectors never make it past this initial rite of passage. They are enamored with the concept though, and confidently walk into their nearest used book store asking for a “First Edition” of, to pick a random example, Harper Lee’s classic (and only) novel, To Kill a Mockingbird. “It will make a nice birthday present for my grandfather,” they say. “Sure,” the intrepid book purveyor replies. “Just got a copy in this very morning and it’s only twenty dollars.” Our uninformed and unsuspecting customer walks out of the store thrilled at having made the steal of the century, utterly unaware that his copy of Lee’s classic is worth not a penny more than what he paid for it, and, in all likelihood, a good deal less, by any objective measure, seeing as how the book purveyor’s job is, after all, to make a profit from what he sells in his store. All of which raises the obvious question “Then what in the hell does it mean to search for and buy a First Edition of a novel?” In truth, this is a question only each individual can answer for himself, for it boils down, ultimately, to what you want to be a collector of. I will, at this point, further clarify my own situation by stating that I am obsessively focused on finding and collecting First Edition/First Printings. It is critical that you think through and answer this question for yourself at the outset, because different answers will cause you to search/shop for very different things, and to come at the exercise with very different pecuniary expectations. Much more detail will follow, but suffice it to say for the moment that our example shopper could, for his twenty dollars, have reasonably come away with only the fifth, sixth, or (possibly) eighth choices presented above, for reasons that will shortly become apparent. 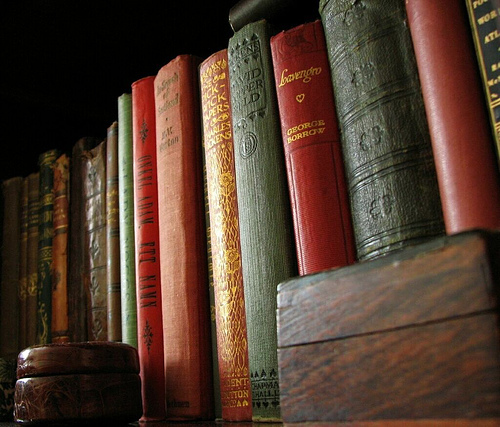 The First Printing of a novel is typically the quarry of choice for the serious book collector. It is the first release of a novel by the book’s original publisher, and it is almost always (but not necessarily) a hard-cover edition, very frequently including a paper dust jacket (though, again, not always). Depending on the book’s success in the marketplace, it may have gone on to subsequent printings and may have been released, as well, in a paperback and/or Book Club Edition. If it really did smashingly in sales, or was later deemed an important/classic work, it may have also been subsequently published in an entirely different edition by a completely different publisher, just to confound things further. It would be inaccurate to assert, as a blanket statement, that First Printings are always the rarest editions, though this is the case more often than not. This is so for many reasons, not least of which is that writers, as with any other vocation, tend to start their careers as relative unknowns, meaning that the publisher will typically have hedged its bet by only releasing a small initial print run (the First Printing) to see how it sold before launching into later editions. This is why the early works of now-well-known authors, e.g., Cormac McCarthy and Thomas Pynchon, are so rare and expensive. So how, then, do you discern whether that twenty-dollar copy you walked out of the store with is, in fact, a First Printing or one of the more mundane alternatives? The first step with any such purchase should be a good bit of on-line research. With relatively brief visits to web sites like www.abe.com or eBay, supplemented by detailed conversations with your favorite book purveyor, you can readily obtain all of the salient information about a particular edition, including issue points (more on these in a bit), typical conditions for the title, and a range of prices you should expect to encounter. As with any significant purchase, the more facts you gather before walking into the shop, the better condition you’ll be in to make an informed decision. Any assessment of a First Edition’s value and provenance begins with a look at the copyright page. This is the (almost always left-facing) page immediately following the title page, on which is displayed the publisher’s name, publishing date, and other assorted details. There are numerous items that may appear on this page, each of which is described below. The bad news is that there have never been much in the way of standards about how this information is to be presented, nor which, indeed, is even provided. For nearly every statement made in the following paragraphs, there will be exceptions. About the only general statement one can make about a copyright page is that pretty much every book published has one, and it’s nearly always on the left side. Beyond that, the devil, as ever, is in the details. Publisher name and year – There will appear near the top of the page the name of the original publisher of the novel and the year of its release. Publishing houses include Random House, Viking, Scribners, and countless others. Every publisher has its own way of presenting copyright information, besides which, for good measure, they periodically change how they do it even within a publishing house, either because of having been bought by another publisher, or just out of sheer cussedness. Typos from earlier editions may have been corrected in later editions. The price can be different. As newer editions get released, prices, of course, will tend to rise, and this is often reflected on the dust jacket. The contents of the dust jacket can change. While the text block should be the same (except for repaired typos), there are frequently changes, sometimes very subtle ones, between the dust jackets of first and later printings. The phrase “First Printing” – Once in a while you will get lucky and a publisher will actually include the phrase “First Printing,” big as life, right there on the copyright page, in which case, nine times out of ten, you’re home free. It’s that tenth time that’s the killer, though, because once in a while that phrase, despite all appearances to the contrary, will NOT, in fact, indicate (necessarily) the true First Printing that the purist is seeking. A notable example of this is the true-crime novel In Cold Blood by Truman Capote, numerous later printings of which are floating around with “First Printing” boldly displayed on the copyright page. Sometimes, just to be really obnoxious, Book Club Editions will also cavalierly use the phrase in their (typically much later) print runs. Ignore it completely – Plenty of books have no number line at all. Use it in the expected manner, i.e., provide a full (1 through 10) number line to indicate a First Printing, and remove one digit for each subsequent printing (typically the lowest number you see in the line indicates the printing). Place the digits in order, but backwards, as in the first example above. Place the digits in some apparently arbitrary order, as with the second example. The best advice regarding number lines goes back to the initial research statement made earlier. Check several sources and see what they say is indicative of a true First Printing. and is, for example, an important first printing issue point on the novels of Ernest Hemingway and F. Scott Fitzgerald. If, on the other hand, you’re looking for a first printing of Norman Mailer’s classic WW2 novel The Naked and the Dead, you’d better keep an eye out for the Reinhart colophon, the absence of which indicates some later edition of the book. Assorted Nonstandard Items – On rare occasions, a publisher will add some additional obscure item to indicate a true First Printing. The most notable example again involves Scribners, who, on many of Hemingway’s and Fitzgerald’s novels, included not only their colophon, but also the simple capital letter “A” immediately beneath the symbol. Thus, you will find slightly later editions of these novels that include the colophon, but not the “A,” an omission that makes many thousands of dollars of difference in the value of the books. Most of the distinguishing elements that identify a true First Printing fall under the general heading of issue points. These issue points can be either on the jacket or in the book, and can include typos, content changes, coloration differences, and an endless host of other possibilities. The best approach will be to simply select a few highly-collectible titles at random, and offer a sense of the breadth, depth, and (sometimes) impenetrability of these issue points. The Sun Also Rises by Ernest Hemingway – Issue points are frequently so unbelievably obscure that it makes one wonder what all the fuss is about and why people pay such enormous premiums to obtain the true First Printing. In The Sun Also Rises, Hemingway’s first full-length novel, there are two principal items that identify a true First Printing, one on the dust jacket, the other in the text. The title of the author’s earlier book, a collection of short stories entitled In Our Time, is incorrectly printed as In Our Times on the front of the jacket. In addition, on page 181, line 26, the word stopped is misspelled as stoppped. These two items (issues of condition aside for the moment) routinely make the difference between a volume that sells for a few hundred dollars and one that sometimes commands in excess of $100,000. The Moon is Down by John Steinbeck – The price difference is not nearly so dramatic in this example, but I include it to demonstrate the profound level of minutia that can be found when dealing with issue points. There is only one known issue point between a true First Printing of this book and subsequent editions. On page 112 there is an errant period between the words talk and this (talk.this). That’s it—one dot. It makes the difference between a book one can easily find for under $100 and one costing as much as five times that amount. One Hundred Years of Solitude by Gabriel Garcia Marquez – A close runner-up for smallest detail to identify a true First Printing goes to Marquez for the exclamation point at the end of the first paragraph on the inner front flap of the dust jacket. There are no other differences between this First Printing and subsequent First Editions, but you will pay several thousand dollars for the privilege of having that exclamation point on your library shelf! Catch 22 by Joseph Heller – The principal difference between the First Printing of this book and subsequent editions is that the full-page black and white photo of Heller that appears on the back of the jacket is of a very young Heller, whereas subsequent editions show a writer who has aged twenty or so years. Numerous maladies can befall a hardback book, examples of which are discussed in this section (dust jacket problems to follow). Despite the most valiant protective efforts of the jacket, a host of issues arise when evaluating the condition of the First Printing you’re about to plunk down your money for. Depending on the value of the book, these imperfections can be worth thousands of dollars or virtually nothing. Very frequently you will see books rated as “Fine” on a web site like ABE, descriptions of which sound identical, except that one is selling for, say, $10,000 and the other for $2,000. “What’s the difference?” you may well ask. Aside from the extent to which some dealers play fast and loose with descriptors like “Fine,” “Very Good,” etc., there are genuine defects that can adversely affect a book’s value a great deal. Reading a hardback book will frequently cause the spine of the book to become angled in such a way that if you look down on the top of it while holding the spine toward your body, the right-hand board will be somewhat forward of the left-hand board. This is an unavoidable consequence of people who hold books open by carelessly cracking the spines backward. This effect is but one manifestation of spine problems in general, problems which tend to be more pronounced the greater the thickness of the volume. More often than not, very large novels will get quite loose in the spine with age. The best editions, structurally speaking, are those whose front cover/board actually offers a bit of resistance to being opened. This, combined with a complete absence of spine lean, is indicative of a book that has not been read at all, the Holy Grail of book collectors. The term tip, in the context of book collecting, refers to the outside corners of the front and rear boards. These take the brunt of abuse when books get tossed around, bumped against the edges of book shelves, etc. It is unusual to find an old book whose tips haven’t been crunched at one time or another, but finding these in pristine conditions is one indicator of what might plausibility be called a Fine book. Tip condition can, believe it or not, easily be one of the attributes that distinguish between the earlier seemingly-identical $2,000 and $10,000 editions. Books that get taken on and off shelves frequently (particularly if it is not an especially smooth shelf) will suffer from some degree of shelf wear, most notably in the fabric along the bottom of the boards. This subtle effect can be another determinant of price of the most expensive editions. Also, the curved upper and lower edges of the spines frequently suffer from wears and tears, particularly at the top as a result of people who carelessly pull a book off the shelf by tugging at the top of the spine with a finger. If thre is resistance to the book coming off the shelf (because, for example, it’s tightly shelved between other volumes), then that unthinking finger will easily cause a tear in the upper spine (and probably the spine portion of the jacket as well). An irritating habit of some book sellers is placing so-called remainder marks on the upper or lower text blocks of books. This is done to indicate editions that haven’t sold in a prescribed period of time and which will, as a consequence, be marked down in price, or “remaindered.” This bit of malfeasance typically takes the form of a felt pen used to draw a colored slash mark across the edges of the pages on the top, or, more frequently, the bottom, of the book. It is important to also leaf through the book you’re considering, to ensure that a previous owner has not written inside with a pen, highlighter, etc. Book sellers will frequently write a price on the inside front cover using a very light pencil stroke, i.e., one that can be easily erased. There is another type of staining that occurs with heavily used older books that is of the far-less desirable sort than the top-staining discussed elsewhere. It’s the sort that occurs when someone carelessly gets water or other unwanted substances too close to the book, leaving permanent stains on either the jacket, the text block, or often both. This can range from quite subtle and barely noticeable to a level of severity that renders the volume valueless. It is also not uncommon to encounter volumes on which one or both boards have somehow managed to become warped, more often than not, in an outward direction, meaning that the board curves away from the text block as you move from the spine toward the outer edges. This is usually an irreparable situation and such volumes should be avoided as collectibles, though they can be obtained as acceptable reading copies. In scouring the internet and book stores for First Editions, one will frequently encounter some that are described as Library Editions. This simply means that the volume was a check-out item in a public library at some point in its past life, and, as such, carries a number of distinctive traits and markings. Typically such volumes are heavily used and not terribly desirable as collectibles, unless their analogous non-library editions are extremely expensive, in which case I have, more than once, forced myself to settle for a library edition until I can muster the cash for a better one. Library editions are often very loose in the spine from heavy reading. They also frequently suffer from many of the maladies described throughout this treatise, including general levels of wear and tear that go quite a ways beyond what one encounters on non-library books. In addition to excessive wear and tear, library editions suffer from other sorts of imperfections all their own, including check-out card slots typically glued onto the inside of a back board, and ink stamps denoting the owning library. One odd but important point of note, though, about library editions. They often have better-than average dust jackets, because they are typically, upon initial acquisition, covered in a protective clear plastic cover which makes them far more impervious to damage than an unprotected jacket. Indeed, I have, more than once, taken the jacket off a library edition, tossed the book, and placed the jacket on a much better non-library volume. Occasionally you will encounter, as well, a rebound book, i.e., one where the original boards and spine have become so damaged (often hanging onto the text by, quite literally, a thread) they have been removed and replaced with new versions. As a general matter, this is highly undesirable, with the notable exception of quite old and fragile volumes whose boards may have become highly damaged or detached from age or overuse, but whose original contents are deemed to be of sufficient value that they are worth preserving nonetheless. Examples that come to mind are nineteenth-century Mark Twain editions and, in particular, original editions of James Joyce’s classic novel Ulysses, original copies of which were released in paper “wraps” in the early part of the twentieth century and most of which have not stood well the ravages of time. Some First Editions, particularly the higher-end titles, will have undergone various levels of restoration during their lifetimes, most commonly on the dust jacket, particularly in high-damage areas like the top or bottom of the spine or along the edges. Most purists will tell you that restoration of any kind diminishes the value of a First Edition, but it is ultimately up to the collector whether you value more highly an untouched volume or one in as fine a condition as possible. An additional, frequently hard-to-find issue point with some books is a code of some sort, typed in tiny font and tucked discretely into the innermost gap between two pages at the front or (more commonly) rear of the book, usually in the few blank pages that often follow the book’s text conclusion. This will typically be an alphanumeric code of some sort. Though the practice has largely fallen out of favor in recent years, many novels used to be printed with the top of the text block stained a particular color. Sometimes these could be quite vivid, and, indeed, the depth and uniformity with which the colors have held up over the years is often a key driver of book value. The top of Pynchon’s Gravity’s Rainbow, for example, is a vibrant orange, whereas some books are stained in more mundane colors, like the gray on Faulkner’s The Town. Publishers are also in the habit of changing certain aspects of the book binding in later editions, including modifying the board colors, printing on the spine, or even the fabric type used to cover the boards. Be certain that, on top of everything else that identifies the First Printing, you have correctly researched the original board fabric, colors, and edge staining. This is arguably the single most important aspect of First Printing identification and valuation. The dust jacket is the paper covering provided by the publisher to protect the book from the abuses of everyday use, e.g., scratches and sunlight. As such, the jacket is the front-line of defense throughout a book’s lifetime, and the older the book, the more the jacket will show the abuse. Therefore, it is typically much more difficult to find a jacket in pristine condition than it is to find such a book. The single most jarring thing one discovers about books after a bit of shopping, particularly for the pricier titles, is that the jacket frequently comprises more than ninety percent of the value of the book. Easily the most dramatic example of this phenomenon is Fitzgerald’s classic The Great Gatsby. The jacket for this petite edition is virtually impossible to locate, and a good condition First Printing without it will run you from $2500 to $5000. Find that original jacket, though, in virtually any condition, and you will have in your possession a treasure worth well in excess of $100,000. The same is true for other books by Fitzgerald (though not quite this dramatically) and for any early Hemingway. Chipping, tears, and general signs of wear – Because the jacket is on the front-line of physical contact with the outside world, it typically has the scars to prove it. Tears are particularly problematic and they are characterized as either closed or open, the former meaning that all of the original material is still there, whereas the latter means a portion of the jacket is entirely missing. Price clipping – Publishers and book stores have, for many years, had the annoying habit of cutting the price off the inner flap of books that didn’t sell within a specified period of time. This simple snip, as with so many other minor flaws, can significantly reduce a book’s value. Sun fading of spine – The most common malady to afflict dust jackets, and the one most likely to shave value off an otherwise valuable book. Volumes that sit for years on shelves exposed to daylight invariably suffer from fading of the jacket spine’s colors. This can range from very subtle differences between the color of the spine and the (usually identical) original color on the front of the jacket, to cases so severe that virtually nothing can be read on the spine at all. The extent of this problem will depend, in large part, on the quality of the publisher’s coloring inks and the paper used to manufacture the jacket. A variation on this problem is the less common case in which a rectangular shape will be faded onto the front jacket of a book because it sat at the end of a row of books on a shelf with a smaller volume covering part of the front, thus shielding some of the jacket from the sun’s rays, but not all of it. The notion of the Book Club Edition (BCE) has been alluded to several times thus far, and it’s time to say a word or two about this unloved stepchild of the book collecting world. Books that do well in their initial publication runs are frequently reprinted in cheaper (both price and quality) editions and sold through various clubs. These editions are also hardback books and very often mirror closely the look and feel of the original, though they are usually somewhat smaller and printed on lower quality paper, both for the text block and the dust jacket. Discerning one of these imposters can be challenging, but a few rules will almost always save the day. The first, obvious place to look is in the lower right corner of the inner front flap. Very often it will simply say Book Club Edition in this spot. Failing this test, removing the jacket entirely and looking very closely at the lower right corner of the outside rear board will frequently reveal a small indentation, usually in the shape of a circle or square, a marking referred to in the vernacular as a puck. This mark is another sure-fire indication of a Book Club Edition, even if there are no corroborating markings inside the book. A third indication of such an edition is the complete absence of a price on the inside front flap. As a general matter, Book Club Editions are to be avoided if it’s true First Printings you’re after. Of course, there will be days when you will find that the true First you’re after costs thousands, whereas a BCE can be had for a few dollars. You will then have a tough personal decision to make! Some first editions, particularly by non-American authors, will have had their true First Printings published in their countries of origin. It then falls to the collector to decide whether they wish to focus their attentions on the American firsts or their native counterparts. I encountered this dilemma when I first set out to collect all of Alistair Maclean’s extensive series of adventure novels from the fifties and sixties. After much thought, I elected to go for the original British First Printings, not because there’s anything inherently superior about them, but simply because he was an English writer, so it seemed fitting. Like all of this isn’t Byzantine enough, you will also hear terms thrown around like “First Printing but Second State” or “Second Issue.” These terms are used to indicate something about the book, either text or jacket, that isn’t the absolute first version to come out of the publishing house. Often, for example, an error will occur that is so egregious that the publisher simply cannot stand to have even the initial print run completed. More commonly, though, the error will still be minor, but the book, having been corrected, will still be regarded as a First Printing but Second State. For example, in the earlier example of Hemingway’s novel The Sun Also Rises, there are examples of First Printings around in which the “stoppped” error was fixed, but the book is still considered a First Printing, albeit Second State. These, needless to say, sell for a good deal less than the edition with the error. Similarly, the dust jacket for the Marquez novel One Hundred Years of Solitude is regarded as Second State if it does not include that all-important exclamation point, even if the book itself is a perfectly acceptable First Printing. This gives rise to the notion of a “mixed state” edition, i.e., one in which the book itself is a First Printing, but the jacket is a later edition, or vice versa. Yet another subtle variation that has tripped up more than one collector is the so-called “Printing before Publication.” I have never quite gotten to the bottom of how this works in the publishing world, but you will encounter, from time to time, a First Edition which says on the copyright page something to the effect of “First and Second Printing Before Publication.” This seems to me to be a bit of an oxymoron, yet they exist and are regarded as inferior, from a valuation standpoint to a true First Printing, though precisely why remains a bit of a mystery. One of the livelier debates attending First Edition collecting is the impact of autographs and inscriptions. The consensus opinion is that any original writing by the author adds value to an already collectible book. But that’s where the agreement pretty much ceases. The first question that arises is the relative value of inscriptions versus simple autographs. Most will tell you that an inscription to a specific individual (e.g., “Best wishes to Bob. John Updike”) is less desirable than the simple signature. On the other hand, you will sometimes encounter lengthy inscriptions (or even occasionally drawings), that are to no one in particular and which, in my opinion at least, are of greater interest and value than the simple autograph. There also arises the issue of where the autograph is best placed. Most collectors prefer that it be on the title page, immediately beneath the author’s printed name. However, you will find autographs in a variety of locations, including blank free end papers. One additional tradition you will encounter with certain authors is the striking through (with a simple pen stroke) of their printed name on the title page followed by their signature immediately beneath. I have not succeeded in locating any historical precedent for this practice, but it is quite widespread and in no way diminishes the value of a signed book. It is absolutely vital to distinguish between books signed directly by the author and those signed on a book plate or other separate piece of paper that has been subsequently affixed to the book. Publishers and book stores will frequently present a client or visiting writer with a stack of adhesive book plates for signature, following which they will adhere them to the inside pages of the writer’s books—books the writer never actually saw or touched. Alternatively, book sellers will often obtain a separate autograph and insert it into the book, then bill it as an “autographed” edition. These practices are widespread, and it is important, particularly for online purchases, to ensure that the autographed book you’re buying is signed directly by the writer. Finally, a word about autograph authenticity. Short of personally being in the presence of the author when they sign your book, it is virtually impossible to authenticate an autograph with 100% confidence. This is, thus, another area in which nothing substitutes for research. Before purchasing a signed book, spend the time online to examine other examples of the author’s autograph. Even this is not a guarantee, as there are some very talented forgers operating on-line. It’s also worth noting that even familiarizing yourself with the author’s “standard” autograph can backfire on you from time to time. New writers typically sign books with their normal everyday signature, whereas well-known writers who are called upon to serve long autograph lines at signings will frequently develop an alternative quick version of their signature that they can execute in a second or two. Thus, if you get familiar with the more common quick version, you might dismiss as unauthentic the potentially more valuable early signature that they provided before becoming famous. To help assuage concerns about the authenticity issue, some sellers will provide, as part of a book sale, evidence of the signature’s provenance. This can include certificates of authenticity or even photographs of the seller at a book signing next to the author. There are, by the way, a few individuals around the country who will authenticate autographs for a price, but I have never employed their services and cannot vouch for their usefulness or veracity. Another interesting wrinkle in the identification of First Editions is the infrequent encountering of association editions, meaning a book that has some direct tie to the author. These associations almost always enhance the value of the book, and they can include copies previously owned by the author’s agent or publisher, a family member, or perhaps linked in some way to a film version of the book. Occasionally you will run into an edition which, while not directly connected to the author, can nonetheless be proven to have once been in the library of a well-known individual. This is usually verified by the presence in the book of a suitably customized book plate. A final topic worth mentioning is the presence in/with a First Edition of various so-called errata and ephemera. Frequently sellers will include assorted other items related to the book, including photos or flyers from signings, or pieces provided by the publisher as part of the book’s initial release. These can include review slips or a host of publicity materials such as printed cards, bookmarks, etc. So what to make of all this arcane business? As with any collectibles, much of the attraction of First Editions is in the hunt. In years past, that meant foraging through the dusty shelves of obscure book shops in little towns, hoping always to find the undiscovered bargain that has been overlooked by everyone else. While this still takes place, a good deal of the mystery and serendipity of searching for rare books has been eliminated by the increased impact of the internet. Instead of relying strictly on the good will and wallets of passers-by, book sellers can now make their wares available to a worldwide market through sites like ABE and eBay. As a result, there has, of late, been a good deal more transparency and standardization in pricing and, hence, less opportunity for finding that steal that no one else has heard about. The upside, though, is a vastly increased ability to locate obscure titles and to educate yourself in the nuances of book collecting. And in an age where all the talk about the future of books is over electronic readers and downloads, it remains a precious and ephemeral thing to lift a First Printing from your shelf, and to hold in your hands the original edition that was contemporary with its writer, open it gently, close your eyes and simply inhale the scent of the paper. Board – The stiff cardboard front and back covers of a hardback book. Book Club Edition (BCE) – Lower quality (usually hardback) edition of a book published after the original First Edition. Closed Tear – Tear in a dust jacket in which no material is lost. Colophon – a.k.a. Printer’s Mark, a symbol placed on the copyright page by some publishers. Copyright Page – The page, generally immediately after the title page, on which is contained all technical information concerning the book, including publisher name, date, number line, etc. Dust Jacket – The paper wrapping often provided with a hardback book. First Edition – General term indicating all editions of a book whose layout and content exactly match the First Printing. First Printing – The very first issue of a book by its original publisher. Foxing – Light brown stains that frequently appear on the pages of older books due to acid content in the paper. Front/Back Free End Paper (FFEP) – Totally blank pages that appear at the very front and/or rear of a book as part of the printing process. Gutter Mark – Small alphanumeric code placed in some discrete location inside a book to denote a First Printing. Library Edition – A book that was, at one time, the property of a public library. Number Line – The sequence of numbers appearing on the copyright page in which is embedded information about the specific printing of the volume. Reading Copy – Copy of a book in acceptable condition for everyday use, but of little or no value as a collectible. Strike-Through – The practice of an author drawing a line through their printed name on the title page and then signing it immediately beneath. Text Block – The collection of pages that comprise the interior of a book (excluding boards). Tip – The corners of the boards of a hardback book. Title Page – the page in the front of the book that presents its title, the author’s name, and basic information about the publisher. Top Staining – Uniform coloration on the top of the text block, typical of mid-twentieth-century novels. I still have a copy of a book on programming the Z-80, an 8-bit microprocessor that was a first-generation integrated circuit and pretty advanced stuff…during the Apollo program. Both for the collector and anyone they happen to live with. Defined here as Twentieth-Century and upward. Once you start poking around in nineteenth-century books, you’re dealing with cracked morocco leather, foxed paper, and other assorted minutia of the seriously antiquated. I choose also to limit the discussion to American fiction, because non-American publishers violate a good many of the rules discussed herein and sorting that all out would cause this essay to easily double in length. The term typically connotes the first time the work ever appeared in print. This, in itself, can greatly confuse things, as some books, for example, appear in other countries before they are released in the U.S. Even the very notion of a First Edition being a book can lead to problems. Some works that ultimately end up printed as complete books are first published in parts in magazines like The New Yorker. Hemingway’s classic The Old Man and the Sea appeared in its entirety as an article in LIFE magazine several weeks before the first Scribner’s edition was released. Don’t even get me started on capitalism and the notion of whether what you pay for something is actually what it’s worth. That will take us way off topic. Good example, Modern Library editions released in the 50s and 60s by Random House. Thomas Pynchon’s dense but classic novel Gravity’s Rainbow was originally issued as a 4,000-copy First Printing, examples of which now routinely fetch north of $1,000. Similarly, Cormac McCarthy’s magnum opus Blood Meridian was first issued by Random House in a 5,000-copy run, and good-condition examples now go for in excess of $2,500. ABE is a web site that aggregates used sales for book shops, large and small, around the world. However obscure the title you’re seeking, if there’s one for sale anywhere, odds are it will be listed on ABE. A terrific number and variety of First Editions are bought and sold on eBay. Interestingly, whereas ABE is the definitive source for the greatest variety of copies of a given title, eBay routinely has better documentation of items than ABE, the latter of which will typically include a single-paragraph description of the book along with a single photograph. Obtaining more detail usually requires direct communication with the book store in question. eBay sellers, particularly for the priciest items, routinely include numerous photos and much greater detail of description than ABE. Of course, as with any online purchase, caveat emptor applies. Though, oddly, this is not always the case. You would think that after enough people had scrutinized a book, all of its errors would have been discovered and fixed. Sometimes, though, books go through many printings while retaining their original errors. It is, thus, somewhat humorous when marginally informed book sellers call out a particular error as being a supposed issue point of the First Printing, when in fact the error pervades nearly every edition of the book. A wonderful example of this phenomenon is the so-called “bite for bight” error (pg. 281) that is constantly cited as an issue point in First Printings of John Steinbeck’s novel East of Eden. In truth, I have never seen any edition of this book, including the most modern, that did not include this “error”. These changes can be positively minute, but can, nonetheless, seriously affect availability and valuation. The award for most subtle change from a First Printing dust jacket to a subsequent edition goes to David Foster Wallace’s vast and wonderful novel, Infinite Jest. The First Printing includes eight short review quotes on the rear of the jacket, the final one of which is by fellow writer William T. Vollman. Trouble is, Vollmann actually spells his name with two n’s at the end, an error that was fixed on all subsequent editions, and which is much sought after by would-be owners of the true First Printing. Printed Oct. 22, 1926, in a print run of 5090 copies. Author photos often play a role in identifying First Printings, also notably the case in the earlier example of To Kill a Mockingbird, First Printings of which have Harper Lee’s photo on the back of the jacket, whereas subsequent editions do not. Book collector trick – It is, in fact, possible to largely undo this effect by holding the volume open, starting from the back, and “reading” it, one page at a time, in the reverse direction, i.e., turning each page and running your finger down the inside center of the spine before proceeding to the next page. It takes a bit of time, but the result is usually quite good. Like, say, The Fountainhead or Atlas Shrugged by Ayn Rand. Another book collector tip – Depending on the depth of penetration of the ink from the remainder mark, it is sometimes possible to remove it through the expedient of sandpaper. This takes a good bit of skill, and the value of undertaking the exercise is a function of the book’s value. A library edition can be as inexpensive as 10% of the cost of a similar non-library edition. Ink stamps (e.g., “Farmington Public Library”) are commonly found on the title page, the copyright page, either the front or rear inner boards, and, most obnoxiously, on any or all of the three edges of the text block. First released in an edition of 1,000 copies (divided into several sub-tranches, some signed, some on special paper, etc.) by Shakespeare & Company Publishing in 1922. This is arguably the single most sought-after First Edition in the English language, with the highest-priced current copy of the First Printing, in its original paper wraps, listed on ABE for $389,000. The fact that this book was banned in America for several years only adds to its mystique, scarcity, and desirability, as many of the original copies were confiscated and destroyed in the early going. This fact also accounts for why some of the extant copies are in unoriginal covers, i.e., one clever way of sneaking copies past the censorship authorities was to change the exterior. The First Printing of The Shining by Stephen King has the code (in tiny font) R49 in the gutter on page 447. Board is the term used to indicate the front and back covers of a hardback book. While the term suggests wood, it is, in fact, a stiff cardboard, typically covered in a tightly-woven fabric. The price of nearly any hard cover book appears on the inner front flap, in the upper right-hand corner. Of course, as with nearly all the rules discussed in this essay, there are occasional exceptions here as well. A particularly notable offender in this regard is William Faulkner’s novel The Unvanquished, nearly all extant copies of which have some variation of brown as their principal spine color, despite the fact that they all started out light gray back when the book was first published in 1938. Gravity’s Rainbow, mentioned at various points throughout this discussion, is also particularly susceptible to fading, due to the vivid orange color used on the jacket. It is a rare copy indeed on which the orange of the spine precisely matches that of the front jacket. Ensuring, of course, that the absence is not due to its having been cut off, as described earlier. A good example here would be Frank Herbert’s science fiction classic Dune, true First Printings of which command thousands, whereas the BCE can be had in decent condition for $25 – $50. The Guns of Navarone, Ice Station Zebra, etc. The same dilemma arises if you elect to pursue First Printings of Gabriel Garcia Marquez, Umberto Eco, Carlos Fuentes, or countless other wonderful, but not American, authors. I was tricked on this issue once when what I thought was a beautiful copy of John Updike’s best-known novel Rabbit, Run turned out to be a pre-printing edition. The difference between these two terms being simply that an inscription is a brief piece of writing by the author (greeting, dedication, etc.) as opposed to a simple signature. Kurt Vonnegut used to have a habit of drawing a humorous self-portrait (frequently filling an entire blank page) along with his autograph. Michael Chabon, on the other hand, likes to draw a small symbol next to each signature that is indicative of the particular book he’s signing. These include, for example, a baseball for autographs to Summerland or a simple key for his signatures to Kavalier and Clay. Sometimes adhering it to a page, sometimes just inserting it loosely. Particularly one for which a significant percentage of the purchase price is due to the signature. Some author signatures are extremely rare and valuable, like, for example, Thomas Pynchon, whereas others, say Norman Mailer and John Updike, would sign pretty much anything that went more than a few seconds without moving. I have a First Printing of Jonathan Franzen’s early novel The Twenty Seventh City that he signed to his brother-in-law using simply his full first name as opposed to his later loopy and much quicker reading/signing autograph. Placed side-by-side one could never guess they were written by the same individual. The value of such certificates is much debated. Gabriel Garcia Marquez’s novel Love in the Time of Cholera was released by the publisher with a color printed promotional postcard, which, if found in an edition now, adds nicely to the book’s appeal and value. In fairness, it should be acknowledged that these changes, while generally beneficial, have also facilitated an increase in the frequency and severity of chicanery, whether in bogus autographs, inaccurately described editions, or other underhandedness. If you’re displeased with your purchase from a book store, any reputable dealer will work hard to make it right. Achieving this after an unsatisfactory online purchase can be unnerving or downright impossible. I bought my hc copy of Infinite Jest back in 1997, about a year after it came out. The novel is obviously a first edition, second printing because there is the first edition wording on the copyright page but the number line ends with a ’2′ instead of a ’1′. Thing is the dustjacket has the misspelled Vollman and also on page 981 of the novel itself there is the typographical half circle on the bottom right of the page which I got to know from other IJ enthusiasts was printed only on first edition, first printing. What do you make of that because I’m still confuse as to which printing of the first edition I owned. That’s a bit of a head-scratcher, frankly. Yes, the misspelled Vollman name on the jacket tells me you at least have a first edition first state jacket. I have two copies of the first printing (one signed!) and they both have the jacket, the “1″ on the copyright page, and the quarter-circle thing on pg. 981 (which I totally didn’t know about, so thanks for that one). My best guess on your situation is that more copies than just the first printing have the quarter-circle thing on pg. 981 (need more research there) and you have a first-printing jacket on a second-printing book, as I know for a fact that the Vollman thing is ONLY on first printings, and I know as well that you need the “1″ on the copyright page. Not sure if that’s helpful or not!